It remains something of a hidden gem in the football calendar, but the biennial African Cup of Nations should really be a fixture in any self-respecting punter’s almanac. Why? Because some of the world’s finest players are in Gabon for the tournament, and few competitions, if any, are as passionate as this. And as we know, the knockout tournament format brings with it plenty of football betting opportunities for profit. Who's Looking Best This Year? African football typically gets short shrift with the online betting community, and that is a shame. With the likes of Pierre-Emerick Aubameyang, Riyad Mahrez and Sadio Mane participating, AFCON is an outstanding proposition for spectators and punters alike. Marking your card with the ‘best teams’ is difficult, as there are so many sides that could go deep into the tournament. The Ivory Coast are the reigning champions and the bookmakers’ favourites for 2017 too, although they look a slightly weaker outfit without the likes of Didier Drogba, Yaya and Kolo Toure, who have all retired from international duty. That said, the evergreen Salomon Kalou will be looking to fire his nation to glory, with talented youngsters like Wilfried Zaha and Frank Kessie hoping to provide the ammunition. Senegal and Algeria have been drawn into the same group in a cruel twist of fate, but with two teams progressing from each bracket to the knockout phase they should have the opportunity to shine in the latter stages. Leicester City duo Mahrez and Islam Slimani will be looking to launch the Algerians towards glory. Many of the Senegal stars will be familiar to fans of English football: Idrissa Gueye, Cheikh Kouyate and Mo Diame all ply their trade on UK shores. And how about the hosts Gabon? They boast the not inconsiderable talents of Aubameyang in attack, and with the likes of Egypt (2006), Tunisia (2004) and South Africa (1996) all proving that the host nation has an edge by winning their own tournament in the past two decades, they certainly stand a chance. What Teams Should Punters be Backing? There is enough evidence to suggest that the Ivory Coast are a little short of value at the 4/1 quoted by the bookmakers. A number of their key figures have retired during the past few years, and emerging in their place is a talented squad of young players who are perhaps a little inexperienced on the international stage. The Ivorians would also meet either Senegal or Algeria in the last four, assuming they win Group C and progress, and that is not ideal. 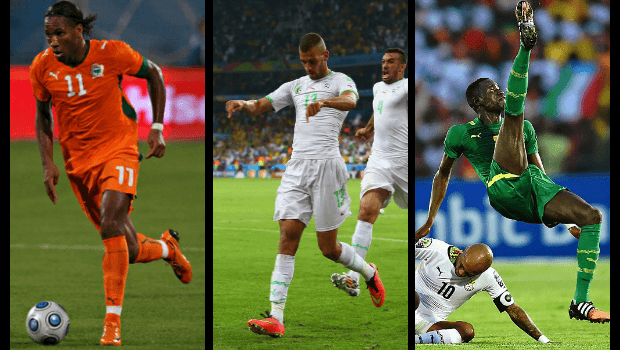 A case can be made for Senegal and Algeria as mentioned above, and the contrast between the pair – the workmanlike and determined Senegal against the flair and guile of the Algerians – should make for interesting viewing. The North Africans don’t have much of an AFCON pedigree, but they were excellent at World Cup 2014, where they qualified from their group before going down in extra time to eventual winners Germany, and so perhaps are getting a taste for big tournament football. Their North African counterparts, Egypt and Tunisia, both have an excellent tradition of success in this competition, but it has been a while since they really made their mark: 2010 was the last time either made the final. The Egyptians in particular have bags of experience at this level, and in Mohamed Salah they possess a genuinely world-class talent. Watch out for the most decorated team in AFCON history. Spare a thought for Cameroon though, a side blessed with enormous talent through the years and a former four-time winner of this event. Some of their best players, including Liverpool’s Joel Matip, Allan Nyom, Maxime Poundje and Ibrahim Amadou, have decided not to link up with the squad and instead stay with their club sides. That is a hammer blow to their nation’s chances. So where is the smart money for the African Cup of Nations 2017? The bookmakers have installed the Ivory Coast as favourites at short odds, but as mentioned there is enough ammo to consider them too short at the price. It is likely that Algeria will kick on from their World Cup adventure of 2014, and while the bookies aren’t exactly enamoured – they are a best price of 7/1 with bet365 – they possess enough quality in attacking areas to suggest they are capable of beating anyone. Each way bets - available at bet365 - pay out at 1-2 odds for any side reaching the final, and as such a small investment in Ghana at 9/1 with Coral appears to be worth a flutter. They have some talented players with plenty of elite-level experience (the Ayew brothers, Christian Atsu, Daniel Amartey etc), and they should progress from Group D alongside Egypt and at the expense of Mali and Uganda. There are plenty of side markets available with the likes of Betway, and one that catches the eye is the Top Goalscorer bracket. Here, it is Aubameyang – who has bagged 16 goals in 15 appearances for Bayern Munich so far this campaign – that appeals at 13/2. You’ll get each way places here too, and Riyad Mahrez at 25/1 looks outstanding value. And here’s one last slab of betting value: Gabon to win Group A at 6/5. As discussed, the preparations of Cameroon have been severely hampered by the late withdrawal of a number of squad members, and the host nation will be looking to take full advantage. AFCON 2017 kicks off on January 14, so there is still time for punters to take advantage of the myriad exclusive promotions and offers presented by the bookmakers listed in this preview. To get started now, head over to bet365's extensive AFCON odds page and start placing your bets today!